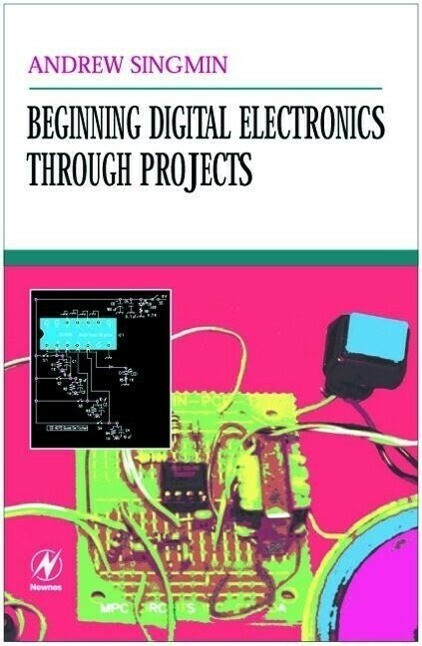 This follow-up to "Beginning Analog Electronics Through Projects" offers readers more practical electronics circuit theory and building techniques with over a dozen useful digital experiments. Step-by-step instructions help readers learn techniques for component identification, soldering, troubleshooting, and more. Quick review of analog circuit fundamentals; Value and application of analog circuits; Introduction to the basic philosophy of digital circuits; Value and application of digital circuits; Logic gates; Test equipment; TTL digital circuits; Power supply requirements; Truth tables for common building block gates; Digital sources and detectors; High-low state displays; Variable rate low speed pulser; Pulse speed reducer; Threshold level detector; Hi-low trip detector; Pulse stretcher; DC level shifter; Schmitt trigger circuits; Digital pulse train Schmitt oscillator; Power turn-off delay Schmitt; Power turn-on delay Schmitt; Triangle wave Schmitt generator; Schmitt switch debouncer; Digital IC build applications; LS 122 monostable for accurate pulse width generation; LS 75 quad latch for capturing pulse transient events; CD 4072 quad OR gate in a multi-input switching environment; TTL relay driver; Special power supply circuits; RF oscillator stable 6 volt supply; stable IC 5 volt source; IC bridge diode protector; Battery or adapter power supply; Jack socket tutorial; Meter overload protector; Simple 5 volt zener supply; Single chip FM receiver using the TDA 7000 IC; Low power FM transmitter; Plus much more.